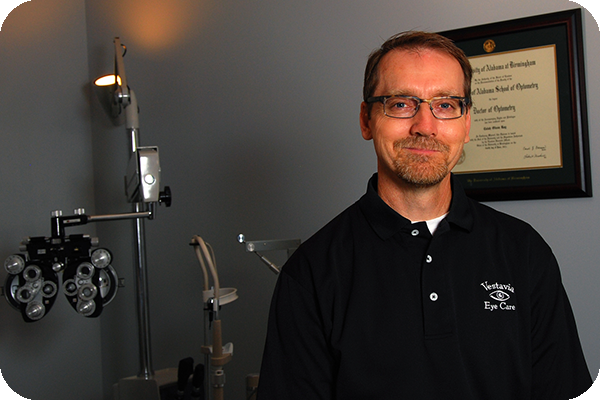 Dr. Essinger received his Doctor of Optometry degree in 1993 from the University of Alabama at Birmingham School of Optometry. He is an Adjunct Professor at the UAB School of Optometry and is on staff at the Birmingham VA Medical Center. Dr. Essinger provides comprehensive eyecare for residents of ten Birmingham area nursing homes. He has received the Vistakon Award of Excellence in Contact Lens Care and the Clinical Science Award for Teaching Excellence at UAB School of Optometry. Dr. Essinger is on the Board of Directors for Cahaba Valley Health Care. He is married and has two teenage sons. He sings, writes music, and plays the guitar. He is an avid disc golfer and enjoys riding his bicycle anywhere and everywhere he can.